Nasr Hanan in the kitchen of what he claims to be his family's apartment. If I understand correctly the man says everyone were sitting in the basement and suddenly they heard a valve of a gas cylinder being opened. He makes a gesture of turning the valve. That would be 4 floors above. Did people from the chopper *place* the cylinder and open the valve? Abdullah Abu Hamam evidently also survived. Is Hamam = Hanan? Nasr Hanan's brother Hamzeh is seen in that activist video lifeless and foaming at the mouth. In the kitchen, he told us how his brother had tried to wash-off the chemicals. Note: In the video report, correspondent Seth Doan mentions inspectors will find "a scene that could have been tampered with" and "eyewitness accounts that can be confusing and contradictory"
0:22 - We were sitting in the cellar when it happened. 0:25 - Seven in the evening the house was hit. 0:31 - We ran out while women and children ran inside the house. 0:39 - They did not know that the house was hit from above and was filled with gas. 1:00 - Q: What happened to the rest of your family? 1:01 - They all died. 1:06 - My wife, my brothers, my mother. They all died. 2:23 - Women and children were sitting in there, and boys and men here. 2:31 - Suddenly there was a sound like a valve on a gas pipe was opened. 2:41 - It is difficult to explain. 2:44 - I cannot explain. 2:52 - I do not know what to say. 2:56 - The situation makes me cry. 3:01 - Children and toddlers, around 25 children. "My wife, my brothers, my mother. They all died." VDC martyrs database lists the one named brother - Hamzeh Hanan and no others (at least one brother missing). By normal patterns if they were Muslim, his wife and mother should both have different family names ("maiden"or father's name), so they may appear (only one "wife of entry" is attached to another man) So we have no explanation for the other three entries with this family name, a woman and two girls Taqa Hanan Adult - Female, Asia Hanan Child - Female, Jana Hanan Child - Female. He blamed the rebel side for doing this and also he blamed the White Helmets for not coming to rescue them when that happened. "This is where the chemical bomb landed. 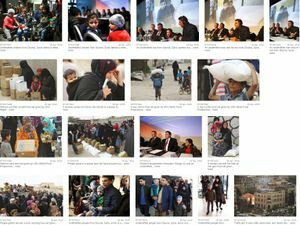 Look," Nasr Hanan, 20, said, ... during a media tour organized by Syrian authorities. ... Hanan and his neighbors said that after the gas entered, the residents tried to get out of the cellar and then escaped to other rooms in the apartment building. Within hours, 25 people had died in a room on the first floor and nine others died in Hanan's apartment on the third floor. Some died on the street. The total number of dead reached around 50, the residents said. 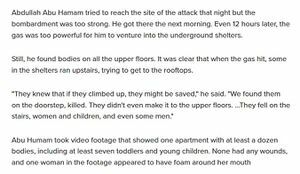 Abu Mohammad, 35, said shells landed on the apartment around 7 p.m. and then "yellow smoke filled the cellar." "It had a very strong smell like a mixture of detergent and bleach," said Abu Mohammad who refused to disclose his real name, fearing repercussions. The apartment is located near Shuhada Square (Martyrs Square) in central Douma. This video (download link) by Russian TV Zvezda interviews a Muhammed Abdul-Manim. He might be the same person. Khaled Abu Jaafar, a "radio station worker" ... "said that as panicked residents started running around after the attack, he rushed to one of these hideouts to check on his friends and help get people out." "While people were in the shelters, some on the roof managed to see the gas bombs as they dropped from the planes," Abu Jaafar said, describing what he said was green gas emanating from the canisters falling from the sky." This sounds like he didn't see that himself, just had it described. "Those who saw them rushed to tell everyone in the basement to evacuate," and he too learned somehow, and ran to help from street level. "I went up and down the stairs about three times to help evacuate children from the building." ... By his third frantic dash down the stairs, with a wet piece of cloth over his mouth and a little girl in each arm, everything went dark ... "I lost consciousness. I couldn't breathe any more; it was like my lungs were shutting down..."
He presumably dropped the two girls in the stairwell then, and they probably died there while he was rescued and lived. Two girls are seen dead in the stairwell of the 35-bodies house in videos filmed that night. (best seen at about 1:45 in this video. One girl has dirty or smoke-stained hands, black and white striped pajamas, is bleeding or laid atop a patch of blood on the stairs, and who later has white foam visible in her mouth that wasn't before. The other girl is a toddler with dirty or smoke-stained and purple hands and grubby red clothes with apparent bleach spots, face covered, laying on the level landing. She's later seen bleeding from the mouth, and display cyanosis later (see this tweet). From these clues, it seems likely the girls were re-arranged, with the blood being from the girl in red, originally laying there face-down and head-down on the stairs. Just below the girls on the stairs is some black cloth, perhaps a sort of bag, partly covering something like a pyrotechnic fumigator with a little pipe apparently emitting light smoke. (same video 0:03, and see this tweet and following discussion). At least one more piece of stray black cloth lays a few steps below that (same video, first frames, and 1:56), just above a larger woman with apparent bleach spots on her clothes, as another view shows, the same set on very gray hands, and possible blood from the nose at least). Khaled Nuseir, 25, vegetable vendor, spoke to AP reporters in Douma. He says he saw the leaking gas cylinder and "said it didn't appear that it was dropped from the air because it still looked intact. "There was no sound of explosion," he said... "If we are standing here and something falls from an aircraft, doesn't it explode? The cylinder was intact when we found it and it was leaking." 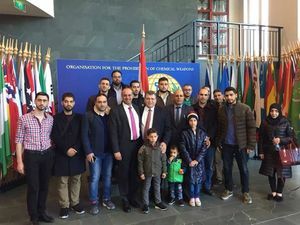 "He and two other residents accused the rebel Army of Islam, which controlled Douma until the militants surrendered it, of carrying out the attack. As they spoke, government troops were nearby, but out of earshot." Mr. Nuseir also says the bodies from that shelter, apparently including his wife and girls, were collected the next day and buried in a mass grave near the zoo. Nusair and two other unnamed "residents" are cited, and an attached photo shows three men, presumably the same. Mr. Nuseir is most likely the one talking. 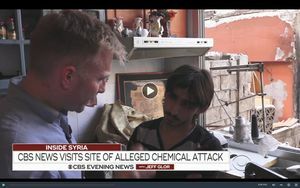 SEE FOR YOURSELF: Horrific account from eye witness of the alleged chemical account in Syria's Douma links the attack to the CONTROVERSIAL US & British-BACKED so-called WHITE HELMETS group. "Abdullah Abu Homam, a local volunteer" told the Times of London he found the entire Bakrieh family of 11 on the bathroom floor of the site with 35 bodies. Exactly 12 bodies total are in that room in the earliest-seen videos. He's quoted as saying "Their clothes were still wet so we believe they tried to rinse themselves in vain. Eventually they must have realised it was over so they drew closer together and died.” In the videos we've seen, clothing appears almost totally dry, but most victims' hair is still wet. (MMM) He also says he found a woman hugging her two daughters way up on the 4th floor of this building. Later, we see 3 people in the stairwell, two girls just above the 2nd floor, and an older woman (more like their grandmother) on the ground floor. "As many as 70 people died, the majority women and children" were killed in the chemical attack, the Times heard, including "Everyone in the Bakriehs’ building and a nearby block of flats... according to Abu Homam." He gives no details on who lived in the other flat, and no images or reports of deaths anywhere else ever surfaced, as the verified death toll stopped at 35 seen in the one locale, and 43 total agreed by most sources, with other locales not explained. I am Masa. We were in Douma basement under shelling. Suddenly they dropped a barrel. It did not explode but it made a "feeshhhh" sound. It is said that he participated in filming in exchange for food, and that an attack was staged, no chemical weapons involved. 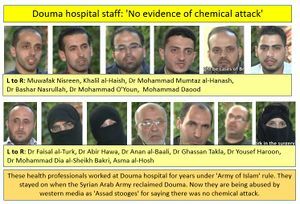 Evgeny Poddubny's report on the false flag chemical "weapons attack" staged by the White Helmets and the so-called rebels. With English subtitles. "[We] Kids were gathered near the hospital and told that we would get cookies and bags of potatoes, if we did everything right. Some people brought large packets, but we were not aware what was inside. Then, we were poured with water from [hoses]. Then, the grown-ups grabbed kids and ran to the hospital. There, we were being filmed. Later, we were given the promised food and told that we were allowed to play, since we were behaving well and did what we were told," Mustafa said. Just call them "unidentified" so no one cares what they say. German private TV n-tv's Dirk Emmerich from Douma (original, on twitter with English subtitles), visits Hospital and meets one guy who Pearson Sharp also ran into. Footage likely from Apr 16. 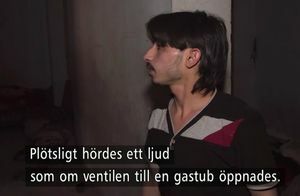 On April 20, German public TV visits a refugee camp near Douma, interviewing "many people" about the attack - nobody has witnessed and all say it was staged. (video, Syria from 6:30, Douma report, around 7:30). From a Russian summary: "They say that this place was the command post of the Islamists, who laid out chlorine cylinders there and waited for the Syrian air force bombarded of such an 'interesting' place. That's what happened, and the chlorine cylinders exploded, - Gak said in a direct inclusion in the heute program ("Today"). (Russian reports on staging the attack follow). One of the local residents of East Guta found in his bed a balloon with chlorine, which he was put in order to imitate the so-called "Himataku", according to the Russian military. "We sat in the basement for several days. I went up to one of the apartments only to see that my chickens were still alive. And then the neighbors said, you have a problem, someone hacked the door to the apartment on the top floor. I went into it, and saw that very cylinder on the bed. How are the chickens? And the chickens rush. Everything is good," said local resident Ahmed. This page was last edited on 19 May 2018, at 10:49.